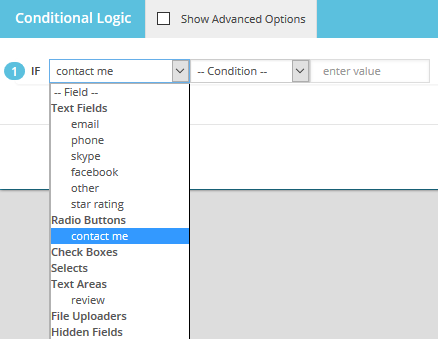 In this example we will use the "contact me" to hide and show field based on the selection. A window will open and it will show you the conditions added for the form. To add a new rule click on "Add new rule". Now we can setup this new rule! For this first rule we want to have the "Contact me" field to show the "Email" field if the Email option (radio) is selected. Choose the condition. In this case we need to use "Equal To"
Add the value. We know that option 1 has a value called Email. So we will add Email into the value field (NOTE: this is case sensitive). That concludes the IF part of the rule. Choose the Action. In this case we will select "Show"
Choose the field that will be affected (show) by the IF trigger. In this case it will be the "Email" field. 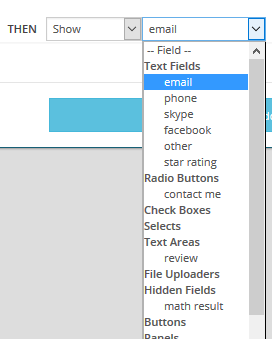 Note: the Email field is a text field so it will be found under the text fields section in the dropdown menu. That concludes the THEN part of the rule. 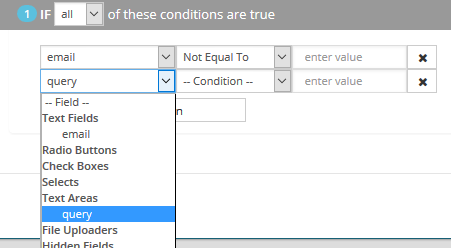 Now we can choose what happens if the condition (specified by the IF statement) is NOT true. You have 2 options, namely: "Reverse Action" and "Do nothing"
What this means is that if the condition is false then the chosen action will be reversed. In this example we stated that if Contact me is equal to the value Email then Show the the Email field. So if the Contact me field is not Email then this will hide the Email field, in other words reverse the action. What this means is that if the condition is false then nothing will happen. This is usefull when you need to run other logic on the field and dont want it to auto hide or auto show like with "reverse" action. In this example we will automaticaly want to reverse our actions we will use "Reverse Actions" for each rule. That concludes the ELSE part of the rule. 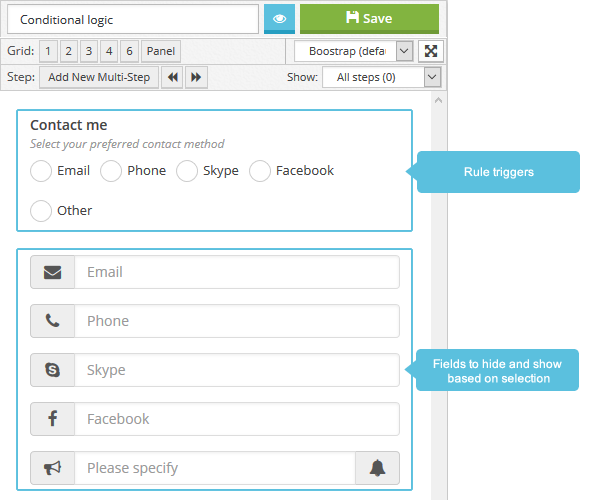 These steps can now be replicated for all the rest of the "Contact me" options to show the relating fields. 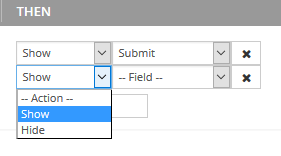 In this example we will create an advanced rule to show the Submit button AND a thank you message only when both the Email field AND Query field contains values, i.o.w when these fields are not empty. Click on "Show Advanced Options" so that its checked(this can be swicted at any time). To add a new rule click on "Add new rule" . You will now have a new rule with advanced options. Choose the condition. In this case we need to use "Not Equal To"
Add the value. We want the action to trigger if the field is not empty so we will leave this value empty. Add Another Condition. We now have our email field setup but we need to do the same for Query. So we click on "Add Condition"
Now we can setup what happens if this IF statements are true. 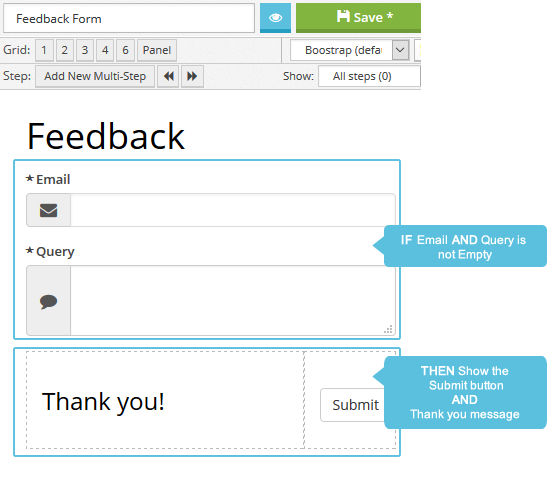 Remember, in this example we will show the Submit button and the thanks you message only when the Email AND Query fields does not contain a value. Choose the field that will be affected (show) by the IF trigger. The first field we will add is the Submit. 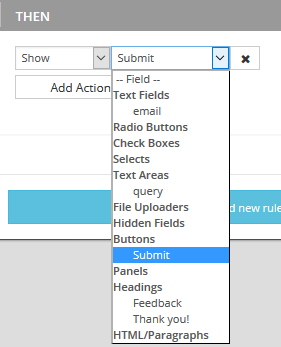 Note: the Submit field is a button field so it will be found under the buttons section in the dropdown menu. Add Another Action. We now have our Submit field setup but we need to do the same for the Thank you message. So we click on "Add Action"
Choose the field that will be affected (show) by the IF trigger. The second field we will add is the thank you message. 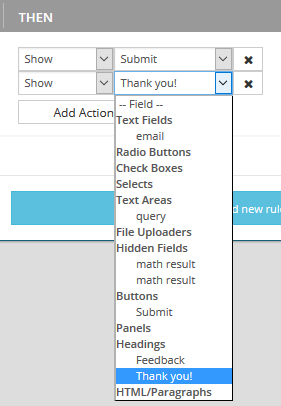 Note: the Thank you message is a heading field so it will be found under the headings section in the dropdown menu. Now we can choose what happens if the condition (specified by the IF statements) is NOT true. You have 2 options, namely: "Reverse Actions" and "Do nothing"
What this means is that if the ALL or ANY of the conditions are false then the chosen actions will be reversed. In this example we stated that if Email AND Query is not equal to Empty then Show the the Submit button and thank you message. So if the Email AND Query fields are empty then this will hide the Submit button and thank you message, in other words reversing all the actions. NOTE: You can have unlimited condition for a rule for the action(s) to be triggerd. You can have unlimited actions to take if a condition or muliple conditions are true.